I had a great time baking my first bread a few months back. Infact I wanted to bake another one soon and had planned for it. As usual, I did not find the time and would wait for the weekend, each new week! Not just does baking bread take a lot of time, it also needs a lot of attention - what with the kneading, rolling and the time taken for the dough to rise. When I saw the Tried and Tasted announcement this month (hosted by Srivalli, originally started by Lakshmi), I knew I had to participate. That's because the featured blogger is Aparna of 'My Diverse Kitchen'. 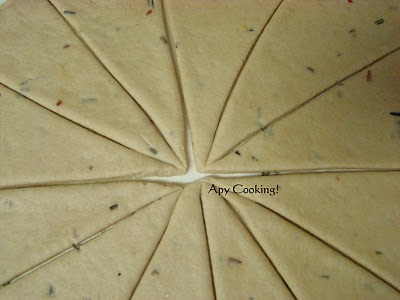 Aparna has a wonderful blog with great bakes, specially bread and I always admire her photographic skills. Apart from that, Aparna has given me very good advice whenever I wanted some. We also share the same name, if you hadn't noticed :). Plenty of reasons for me to try and taste, eh? So it was decided. 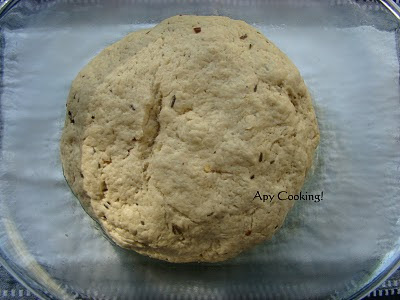 I would bake a bread with Aparna's recipe. I bookmarked a few of her posts on bread and finally decided on one, which I wanted to bake the following weekend. But something or the other would come up till I was down to the last weekend before the final date. So it had to happen that weekend! That's when I saw this post on Crescent Rolls with garlic and whole wheat and fell straight for it! My husband took care of our little inquisitive toddler while I confined myself into the kitchen with my foot down baking this beautiful bread which filled the house with a comforting aroma I always love! 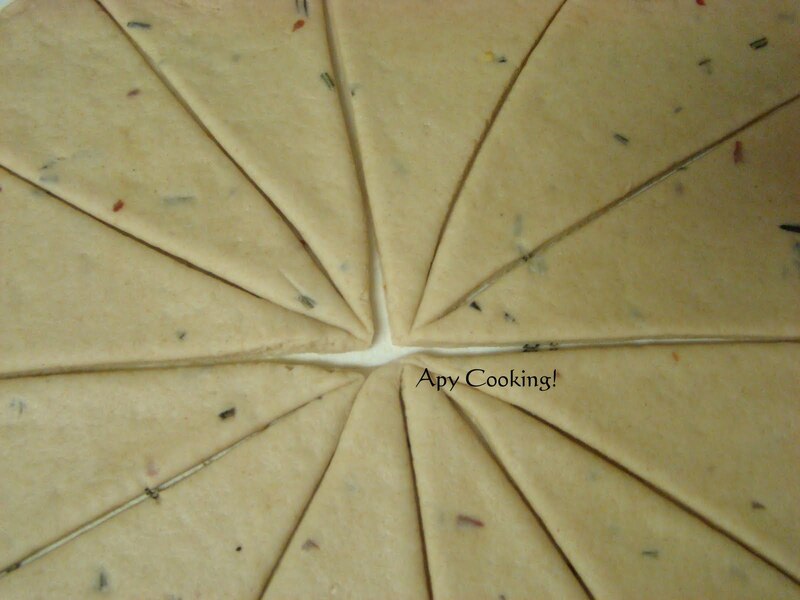 Thanks Aparna for this wonderful recipe. Combine milk and honey in a small vessel. Dissolve yeast and allow to froth, about 5 to 10 minutes. Heat oil. Add rosemary and roast a bit. 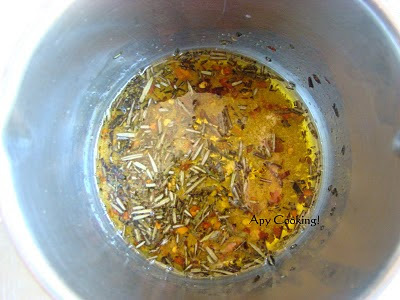 Add garlic powder and chilli flakes and roast a little more. Allow to cool. 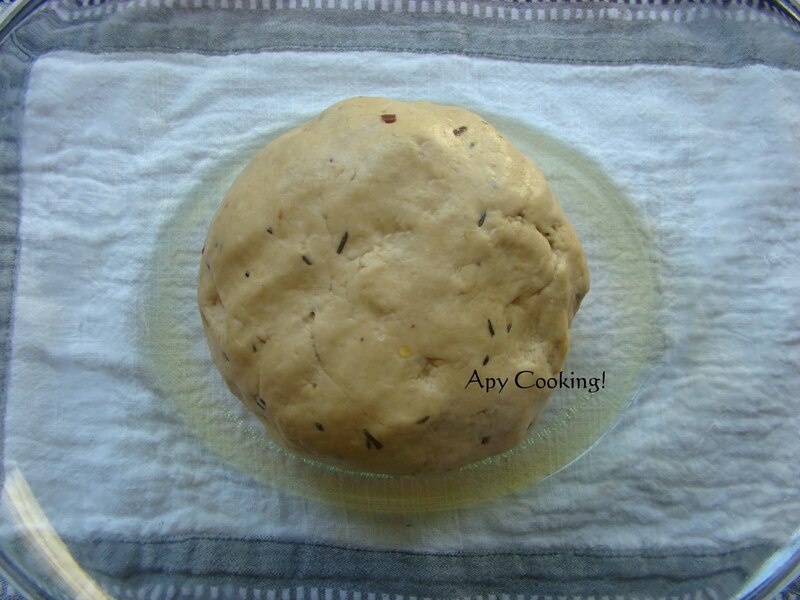 Knead flour with the flavored oil, yogurt, salt and the yeast mixture until you get a smooth and soft dough. If it sticks to your hand, add some more flour and knead further. Grease a fairly big container with olive oil. 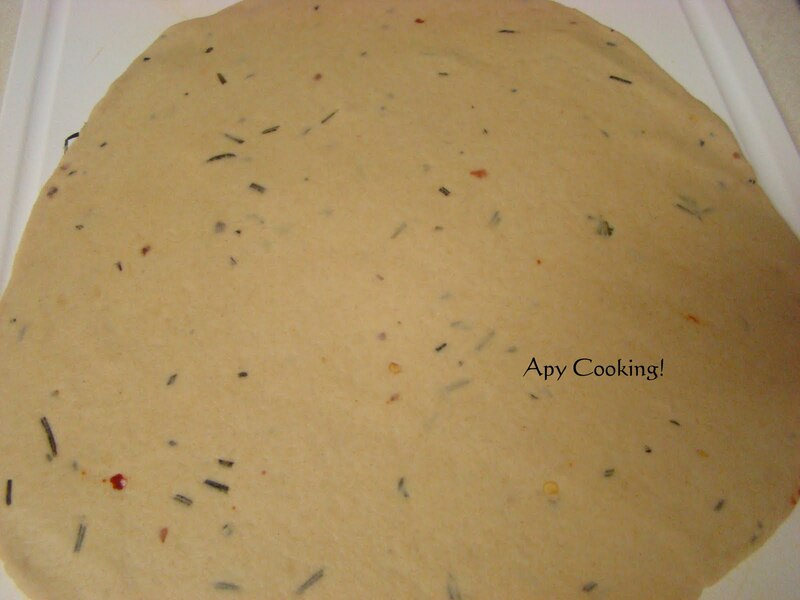 Transfer the dough into this, covering and coating the dough with oil. Cover with a plastic wrap or a lid and leave aside for 2 hours. 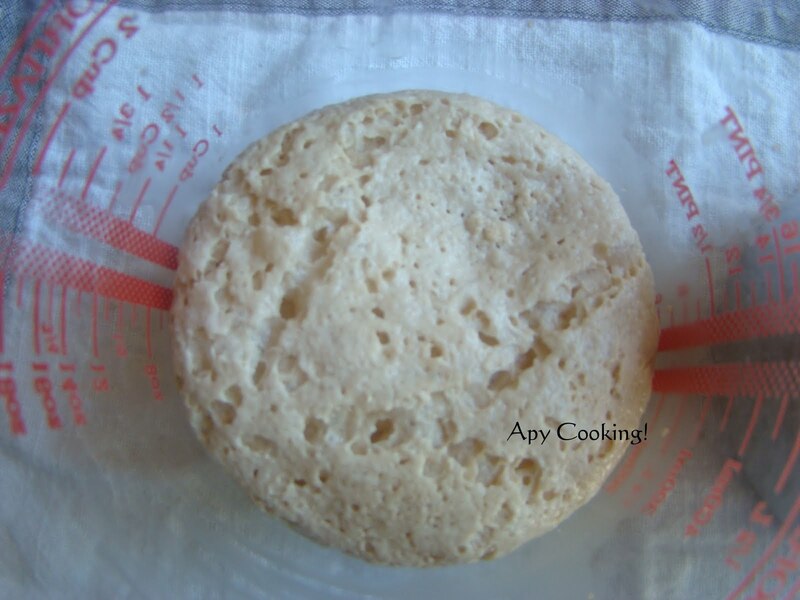 The dough will rise and become almost double in size. Transfer each of the roll onto a greased baking dish (I used a greased aluminium foil on the dish), making sure the tip is under the roll. Cover loosely and let it rise again, about 45 minutes. Repeat with the other ball of dough. Bake at 400ºF for 18 to 20 minutes. Lightly brush with butter just before serving. I enjoyed the entire experience of baking the bread. Hoping to make another one 'soon' :)! The warm buttered rolls also go to Hearth and Soul, Bake Off , Yeastspotting and Cakes and Bakes. Garlic Rolls look so tasty and perfect. Perfectly done !! Liked the step wise pictures.. They do look perfect, Aparna. Even though they're whole wheat, these rolls have become a favourite here. Yes, we do have a lot in common, don't we? 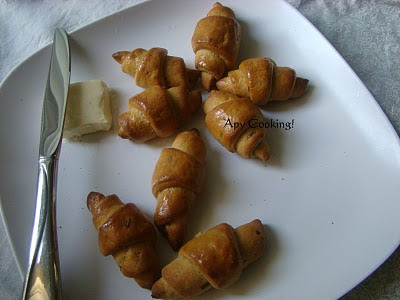 Cute looking crescent rolls...yum, feel like grabbing some..
Bookmarking, very nicely explained and they look so tempting. Wow...really beautiful looking crescent rolls with that golden brown color. 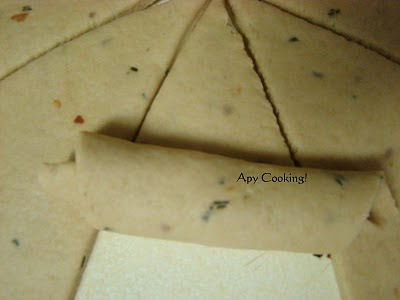 I am so going to make these..u made them perfectly aparna..very nicely explained! Wow! 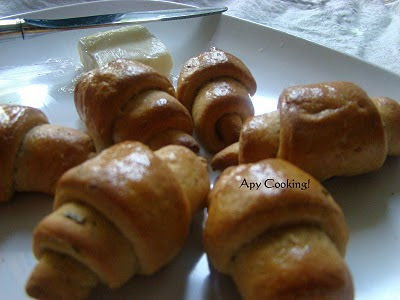 These crecent rolls look so cute. So flavourful and yumm. They look perfectly baked, the golden-brown colour is really sensational. Bread is the eptiome of home-baked goods! Wow!! Very professional! Your rolls look super! Nicely explained dear, and very well made. Thanks to both aparna's for sharing it. These sound lovely - and your photos are great! Wow the rolls remind me of croissants... Perfect rolls... I will definitely try this shape for my rolls. Crescent rolls looks perfect, yummy and gorgeous. thanks for your lovely recipe. What impressive rolls you have baked Aparna!! They look seriously good!! 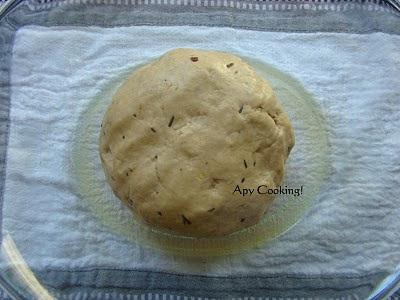 Am itching to bake bread again and hope to do so sometime soon. First time here...just love going through ur space....wonderful collection of recipes. 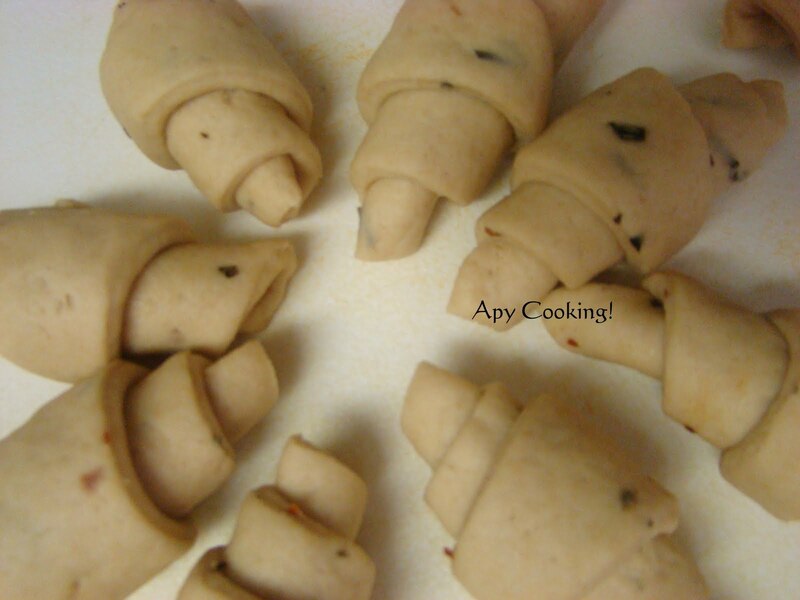 I have never attempted crescent rolls - your pictures are great! Thanks for linking to the hearth'nsoul blog hop! Aparna, THanks for such a wonderful entry. I loved the step by step pictures. Mmm, love the combo of rosemary and garlic in baked goods. Thanks for sharing at Hearth and Soul. Wow those look great inviting!..thanks for sending the entry!